If you'd like to start making your own personal care products, lotion bars are an excellent beginner-level project. Lotion bars are solid moisturizers that look like decorative soaps, but are activated by your body heat. You simply rub the bar on your dry skin to apply the lotion. Many of the basic ingredients for making lotion bars, such as honey, olive oil, and coconut oil, can be found in your kitchen. Essential oils, beeswax, and shea butter can be purchased at most larger craft stores or online through a site such as Brambleberry. 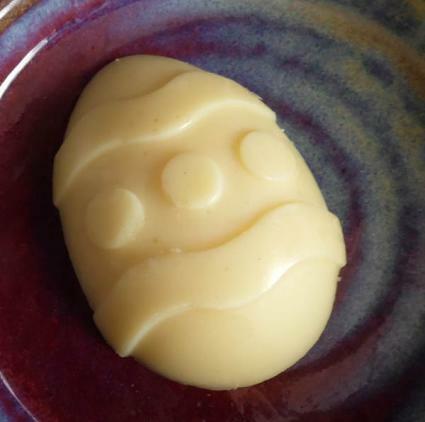 You have several different options for lotion bar molds. You can use an ordinary muffin tin with paper liners and peel back the paper when you're done. You can use novelty shaped silicone baking molds, which is a fun option if you're making lotion bars as a gift. Use muffin sized molds for standard lotion bars or make mini lotion bars with decorative ice cube molds. You can also buy regular bar shaped molds or novelty shaped molds from a retailer that sells soap making supplies. Lotion bars are designed to melt when they come in contact with a heat source, so careful packaging is a necessity. Cover the finished bars in plastic wrap and seal with a large sticker or decorative tape. You can also package the bars in recycled candy tins. 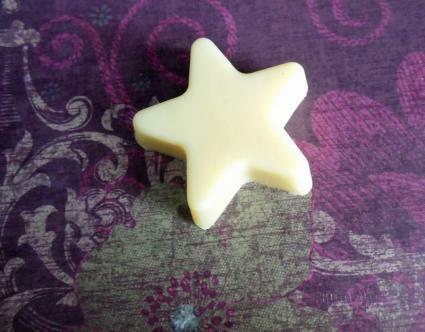 This is a basic lotion bar with a pleasing scent. The peppermint essential oil is uplifting, while the lavender essential oil soothes the spirit. Melt beeswax, shea butter, and coconut oil in a double boiler until you have a smooth liquid. Remove from heat. Add the lavender and peppermint essential oil. Pour into molds. Depending upon the size of molds you are using, you should end up with three or four large lotion bars. When the mixture is completely cool, remove from molds and package as desired. 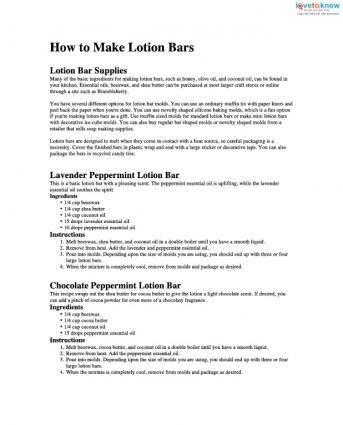 This recipe swaps out the shea butter for cocoa butter to give the lotion a light chocolate scent. If desired, you can add a pinch of cocoa powder for even more of a chocolaty fragrance. Melt beeswax, cocoa butter, and coconut oil in a double boiler until you have a smooth liquid. Remove from heat. Add the peppermint essential oil. 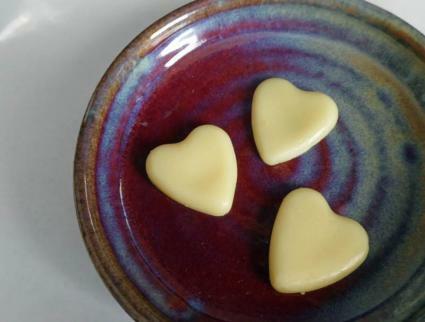 This lotion bar adds honey to help enhance the natural scent of the beeswax. Honey is also full of natural antioxidants that help slow down the skin's aging process. Remove from heat. Add the honey, olive oil, and orange essential oil. Stir well so the honey is completely dissolved. Pain relief lotion bars are a natural alternative to Bengay and other similar products. You can adjust the strength of the essential oils as needed to create a lotion bar that best suits your needs. Remove from heat. Add the essential oils. If you're not a fan of all the chemicals used in traditional insect repellents, this lotion bar will give you soft skin as it helps keep the bugs away. Thieves oil is a blend of clove, lemon, cinnamon, eucalyptus, and rosemary essential oils. The name comes from a legend that says robbers who stole from people who had died from the Bubonic Plague would use a blend of essential oils to protect themselves from becoming ill. If you don't like the scent of the thieves oil blend, you can try making your own blend from these base oils. You can download and print all of the above recipes for your own personal collection. Just click on the image below for the .pdf file, then save the file to your computer or print it out right away. Click here to print the recipes. One of the best things about handmade lotion bars is that they're a completely waste-free product. If your bar accidentally cracks when you try to pull it out of the mold, simply melt it down and try again. You can also save the leftover portions of used lotion bars and melt them down to make a new bar for yourself.